Previously, scientists could only guess what colours huge reptiles, such as mosasaurs and ichthyosaurs had; however, pigment preserved in fossilised skin has now been analysed at SP Technical Research Institute of Sweden and MAX IV Laboratory at Lund University in Sweden. 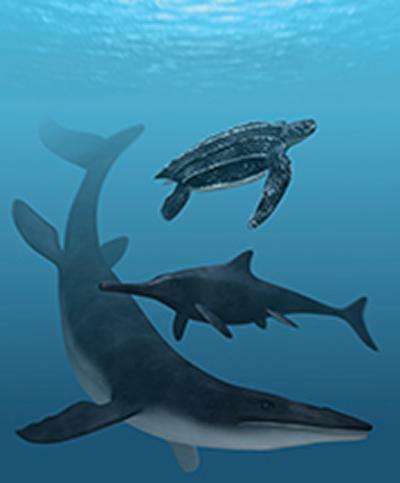 The unique soft tissue remains were obtained from a 55 million-year-old leatherback turtle, an 85 million-year-old mosasaur and a 196–190 million-year-old ichthyosaur. Mosasaurs (98–66 million years ago) are giant marine lizards that could reach 15 metres in body length, whereas ichthyosaurs (250–94 million years ago) could become even larger. Both ichthyosaurs and mosasaurs died out during the Cretaceous Period, but leatherback turtles are still around today. A noticeable feature of the living leatherback turtle, Dermochelys, is that it has an almost entirely black back, which probably contributes to its worldwide distribution. The ability of leatherback turtles to survive in cold climates has mainly been attributed to their huge size, but it has also been shown that these animals bask at the sea surface during daylight hours. The black colour enables them to heat up faster and to reach higher body temperatures than had they instead been lightly coloured.